Washington County elections officials are encouraging voters to mail or drop off their ballots as soon as possible this election season so that all ballots are processed in a timely manner. Voters should have received their ballots by mail over the recent weekend. Information about vote-by-mail, voter eligibility and other election matters may be found at the Washington County Elections Office website or by calling 503-846-5800. 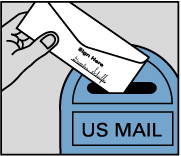 Voters will have until May 11 to send their completed ballots in appropriately signed envelopes with a postmark from the U.S. Postal Service. After this date, completed ballots should be dropped off at official collection sites in order to meet the election's 8 p.m. deadline on May 16. 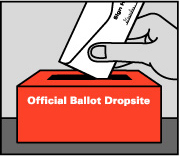 Many ballot drop sites are inside or outside of WCCLS libraries. Check the list to find one near you!